By Jeff Aranow: Interim WBA heavyweight champion Luis “The Real King Kong” Ortiz (25-0, 22 KOs) believes the top heavyweights in the division are going to have to fight him sooner or later. 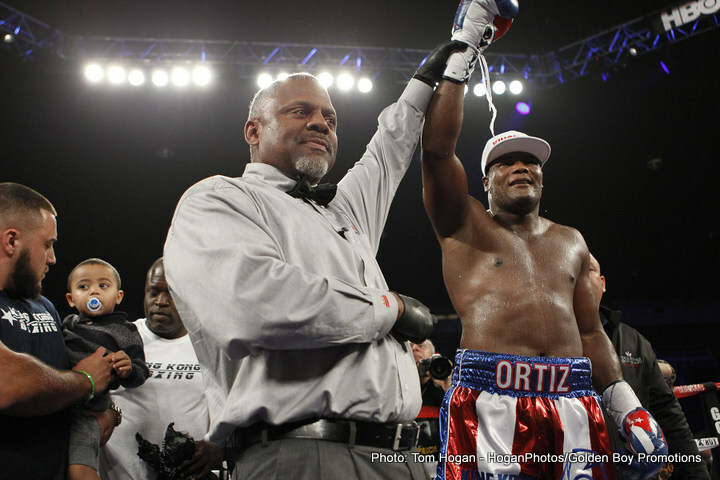 Ortiz, who is backed by Golden Boy Promotions and being heavily hyped by HBO Boxing, defeated 44-year-old Tony Thompson (40-7, 27 KOs) last Saturday night at the DC Armory in Washington, DC. Ortiz, 6’4”, 242lbs, knocked the 6’5” southpaw Thompson down three times in the contest in dropping him once in the 1st, 3rd and 6th round. Referee Malik Waleed was finally forced to stop the fight at 2:29 of the 6th round after Thompson hurt his right knee while falling down from a knockdown. I think Ortiz is kidding himself. The other heavyweights don’t have to fight him, and they probably won’t. Despite HBO televising all of Ortiz’s mismatches against soft opposition, he’s not building enough of a fan base to make it worthwhile for any of the top heavyweights to fight him. Unless Ortiz can sell out stadiums in the U.S and bring in monster ratings on HBO, he’s a nonfactor compared to the other heavyweights that can do all these things. Anthony Joshua can sellout large arenas in the UK. The same with Tyson Fury. Deontay Wilder brings in huge crowds in Birmingham, Alabama and good ratings on Showtime and Premier Boxing Champions. Ortiz is far away from building a fan base big enough for him to lure the other heavyweights. What further hurts Ortiz is his age. He just turned 36, but he doesn’t look like a young 36. Last night, Ortiz looked like Larry Holmes at the end of his career. You’ve got to figure that it’s going to turn at least four to five years for Ortiz to build a decent fan base. Look at Gennady Golovkin. He’s been fighting in the United States since 2012, and he’s only now building a fan base. In four years, Ortiz 40-years-old, and he’s probably not going to fast on his feet by that age. Ortiz looked slow, old and hittable last night against Thompson. Both guys looked the same age to me. The only difference is Ortiz had better punching power. Hopkins is the exception to the rule. He’s incredibly special in the way he aged. When Hopkins was 36, the same age that Ortiz is now, he looked like he was in his 20s. Hopkins was very youthful at 36. Ortiz does not look youthful for his age, and he definitely doesn’t move fast. Ortiz was slow last night, and sweating badly from the 2nd round. Luckily for Ortiz, Thompson wasn’t capable of fighting at a fast pace, because if he did, we might have seen Ortiz gas out. That’s how Ortiz would lose his fights in the amateur ranks. He would face fighters that would push a fast pace and he would tire out quickly and not gain a second wind. Fortunately for Ortiz, his promoters at Golden Boy Promotions have been matching him up exclusively with heavyweights that fought him at a slow pace, and this has allowed him to get plenty or rest breaks that his aging body needs. A prime Evander Holyfield would be a nightmare for someone that needs rest breaks like Ortiz. I think Holyfield would have easily beaten Ortiz. Ortiz landed 88 of 250 punched for a connect percentage of 35%, according to CompuBox. Thompson connected on 43 of 221 punches for a 19% connect percentage. Right now, the priority is to try and get Ortiz a fight against the 6’7” Alexander Ustinov. I’m not sure if Ustinov is going to take that fight, though. If he doesn’t, then he’s going to mess up his chances of getting a shot at the WBA title. The WBA will have to replace Ustinov with the next available contender that is willing to face Ortiz in the WBA tournament if Ustinov chooses not to take part. That would be #7 WBA Andrey Fedosov. « Jessie Vargas: I want a rematch with Tim Bradley!